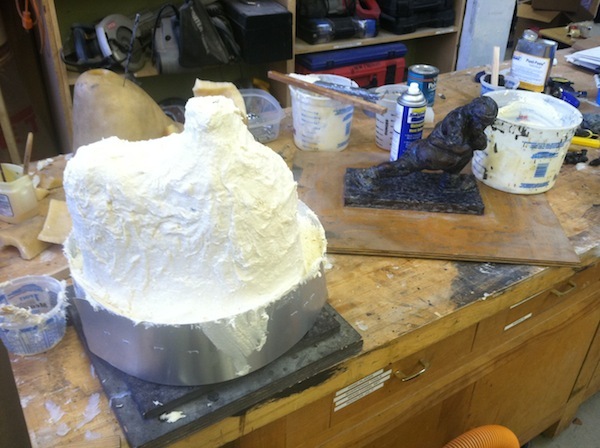 I’ve always tried to improve the process by which I sculpt, make a mold, cast, and then ultimately finish a fantasy trophy. When I first had a mold made of the Armchair Quarterback trophy, way back in 1995, it was made out of plaster and was a two part mold. As the years went on I realized I could make a one part blanket mold that would not only speed up the overall process, but also make a better product. The seam running down the middle of the trophy would finally be eliminated. This past year I invested in a few pressure pots which push upwards of 60 pounds of pressure down into the mold while casting. This pushes out any air pockets which may be present inside the resin and again makes for a better product. The only problem was that the molds for any of the Armchair trophies and the one for The Throwback were too big to fit in the pressure pot. An alteration to those molds was necessary. This week I’ve decided to tackle that issue. James, my mold maker and assistant, is finally making the mold for The Throwback smaller so that it can fit in the pressure pot. This will result in not only a better product, but a longer lasting mold because sharp points created by air pockets won’t damage the mold when taking the Throwback out. Exciting times here at FantasyTrophies.com!